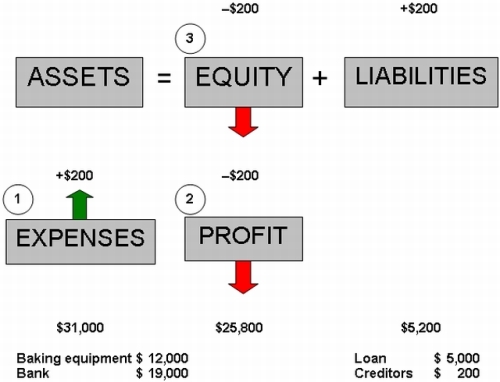 Income and expenses are recorded using the accrual basis of accounting. And accrual describes amounts that have been accumulated and are still owed. Thus accrued expenses are expenses that are owing. Who owes the expenses? You do, of course. Or at least the business we're doing the accounting for. i) George Burnham receives the telephone bill from the telephone company on the 30th of April. It says that George’s Catering owes $200 for the month of April. The telephone company offers payment terms of 15 days from the date that the bill is received. George intends to use these payment terms and pay after a week or two. How does this transaction affect the equation on the 30th of April? Has any cash moved at this point in time? Have we actually paid the telephone bill yet? The answer is no. In fact, our assets do not change at all at this point. The telephone bill is an expense – it is an event that results in money flowing out of the business (immediately or at a later date). The expense (event) has occurred – the telephone has been used in April. Remember that according to the accrual system, we record the expense when it occurs, not later on when cash is paid. As a result of receiving this bill, our liabilities increase. This liability is not a loan, but it is a liability. This liability of $200 is included under creditors (various businesses and people we owe). Liabilities increase on the credit side. So credit creditors. The owner’s stake in the assets of the business (i.e. equity) decreases by $200 to $25,800. The external parties’ stake in the assets of the business (i.e. liabilities) increases by $200 to $5,200. Remember, if you're not feeling so good about this lesson (or any other), it is highly recommended that you take a step back, and try find out which earlier concept you didn't quite get the first time. When you find the earlier misunderstanding, roll forward again. Of course, if you feel happy with this lesson, then just keep moving.